1. 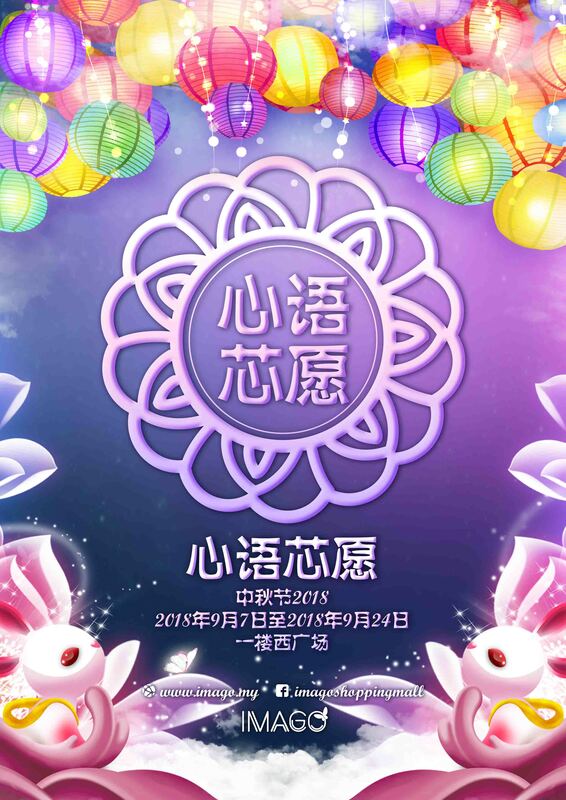 Imago Shopping Mall Management, the (‘Organiser’) will be organising a Mid-Autumn Festival event, (“Eternal Wish”) in Imago Shopping Mall from 07th Sept 2018 to 24th Sept 2018, from 12:00am to 8:00pm daily (‘Event Period’). 2. Lantern and Wishing Star Give Away available on every day during the event period. It is located at West Avenue, Ground Floor, from 12:00pm to 8:00pm daily. Lantern and Wishing Star Give Away is designed only for children aged 15 and below for free. 3. One child is entitled for 1 lantern and 1 wishing stars paper per day. Lantern have limited amount every day, hence it is first come first serve basis. Identification card / passport will be checked upon redemption. 4. Violation of terms and conditions will result in expulsion without refund. 5. Food and beverages, sharp objects or any object which the Organiser considers dangerous are strictly not allowed during any Mid-Autumn Festival 2018 activities. 6. Conduct that is disorderly, disruptive or in poor taste is prohibited. Vandalism is prohibited and any damages incurred by the participant(s) will be fined accordingly. 7. The Organiser reserves the right to refuse your admission if we foresee your conduct may lead to possible danger or injury to yourself and/or others. 8. All terms and conditions are subject to change without prior notice. 9. The Organiser shall not be held responsible for any Acts of God that may result in personal discomfort or unforeseen performance conditions. 10. The Organiser reserves the rights to publish the Participants’ photos for marketing campaigns & purpose. All the Participants are deemed to have consented to the Organiser, Imago, Asian Pac Holdings Bhd and its subsidiaries for using their personal data which may be used as part of the Imago and/or their partners' database for future marketing purpose unless otherwise stated. 11. To the maximum extent permitted by law, the Organiser accepts no responsibility whatsoever for any damage, loss, death or personal injury that may occur as a result of an individual’s participation in this Mid-Autumn Festival 2018 activities. The Participants agree to indemnify the Organiser against any loss, damage, claim, cost and expense which may be incurred or suffered by the Organiser as a result of the Participant’s breach of these term and conditions. 12. By participating in this Mid-Autumn Festival 2018 activities, the Participants agree to be bound by these term and conditions. 13. These Terms and Conditions is in English language and all versions hereof in any other language will be for accommodation only. In case of inconsistencies and discrepancies between English version and the other version of these Terms and Conditions, the English version shall prevail.